Upon launching a website design or redesign project many businesses focus on the wrong things when choosing a partner. This can often lead to significant regret down the road, not to mention expense. Web design isn’t just about price. It isn’t just about choosing a company that makes pretty websites either (although the design is important). When you hire a web design company you are selecting the platform and infrastructure of the site, its layout, design as well as its appearance. Almost as important as the appearance of a website is the platform on which it is built. A website content management system (CMS) is a sophisticated tool. A CMS is what allows you to edit and change the look of your site without having to use code. This makes it much more user-friendly. The most important thing you should ask yourself before moving forward with a website design or redesign is how the site will be used? Will content development be a significant part of the website? Will a third party be responsible for making updates to your site or do you want to some flexibility in making changes internally? What is the lifespan of the site? Will you want to make design changes in the foreseeable future? Understanding the purpose and function of your site will help you make a more informed decision when it comes down to choosing a web design agency. At MindStream Creative, we build all of our websites on WordPress. Thirty-three percent of all sites are built on WordPress. And WordPress isn’t just a bunch of templated sites. We customize all of our websites but use WordPress as the CMS. Here are a few big names that use WordPress too. WordPress is open source. This means that anyone can create new plugins or themes, which provides endless options for customizing design and functionality. WordPress is scalable. From small sites with just a handful of pages to sites with hundreds, WordPress can handle them all. WordPress is search engine friendly. Having a website that isn’t found online is pointless. Search engine optimization is critical to improving website rank. Built into WordPress are features like permalinks, robots.txt, RSS feeds, sitemaps and breadcrumbs to name a few. You can also add plugins to optimize your site for search further. Google alone has an estimated 40-60 billion searches every month, and Google likes WordPress sites. If you want to ensure your website is ranking well on Google, WordPress is a great start. WordPress is intuitive and easy to use. Let’s be honest, when you want to make a quick change to your website, you want it done fast. If you don’t want to wait for a developer, WordPress is your new best friend. Within WordPress, you can access the pages on your website and make simple changes without having to understand code. That is a game changer for most businesses! WordPress is responsive. Having a website that is mobile and tablet friendly is critical. Gone are the days of pinching to zoom (you know what that is, right?). A correctly coded WordPress site is responsive and easily viewed on any device. WordPress is multi-user friendly. This is an excellent option for businesses who want to provide multiple people access to their site. Plus, you can pick and choose the level of access each person has to protect the integrity of your site. 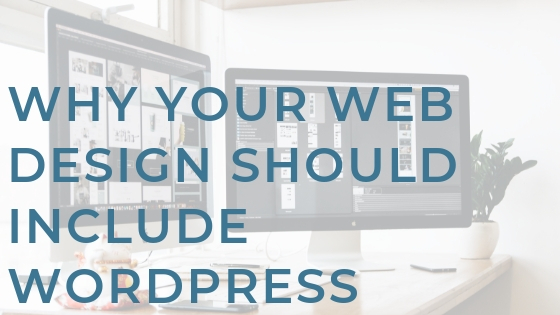 If you are in the market for a new website, don’t get too caught up in design or price alone. Think long-term and choose a designer that is not only cost-effective but uses a platform that parallels your business goals. Custom and semi-custom websites built on WordPress do not have to be expensive to be beautiful and functional. Don’t let anyone tell you different.